The Nokia Lumia 925 has many of the same features of its predecessor, but is thinner, lighter and uses an aluminum frame. The Windows Phone OS still has some annoying limitations compared to competing platforms, but the Lumia 925 is without a doubt the best Windows Phone yet. Nokia's new Lumia 925 Windows Phone is seemingly a direct response to criticism of the flagship Lumia 920. It has many of the same features of its predecessor, but is thinner, lighter and uses an aluminum frame. The Windows Phone OS still has some annoying limitations compared to competing platforms, but the Lumia 925 is without a doubt the best Windows Phone yet. The Lumia 925 is one of the most stylish smartphones on the market. The Nokia Lumia 925 is one of the most stylish smartphones on the market. The phone appears to be Nokia's direct response to criticism of the previous Lumia 920, which we found a little too thick and heavy despite its fantastic camera. The Lumia 925 is much thinner and is the first Lumia device to use a largely aluminum case. At 139g, the Lumia 925 is almost 50g lighter than the Lumia 920 and is just 8.5mm thick compared to 10.7mm. Although the frame is aluminium, the back of the phone is a polycarbonate piece that is available in black, white or grey colour variants. The gap between the polycarbonate back piece and the aluminium frame detracts from the overall look and feel but build quality feels otherwise exceptional. The Lumia 925 is almost 50g lighter than the Lumia 920. While it will ultimately be a personal preference, we much prefer the white and grey variants to our all-black review unit. The black model does little to stand out, even if it does look sleek, though we admit we may have been spoiled by Nokia's usual vibrant colour choices. The lack of a memory expansion slot will be an annoyance to many potential users. Another downside to the design, and an issue with most Windows Phones, is the lack of microSD card slot. The Lumia 925 only has 16GB of internal memory compared with the 32GB of its predecessor, and the lack of an expansion slot will be an annoyance to many potential users. Nokia says Vodafone will exclusively sell a 32GB model in Australia, but everyone else is stuck with the 16GB variant. Finally, the speaker position on the back of the phone isn't the best location, as sound tends to be muffled when holding the device single-handedly. Despite the resolution not being full HD, the screen is excellent. The Lumia 925's display now uses AMOLED technology rather than the Lumia 920's IPS panel, but it's the same 4.5in size and 1280x768 resolution. Despite the resolution not being full HD, the screen is excellent. It offers good colour reproduction, above average viewing angles and also performs very well in direct sunlight. It's also very responsive to touch and can be used even if you're wearing gloves. The Lumia 920's screen is excellent and performs well in direct sunlight. Using the Lumia 925 is a very similar experience to most other Windows Phones, including the Lumia 920, and that is a real positive. The software is fast, there's very minimal lag, and most apps run smoothly. Scrolling, especially in the Internet Explorer browser, is smoother and faster than nearly all Android phones we've used. It's a familiar experience overall but a very polished one. The Windows Phone 8 ecosystem might lack many third party apps but it does have some excellent and often overlooked core features. The 7GB of free SkyDrive cloud storage, and the built-in Microsoft Office app are two of the best, while Nokia's preloaded apps include the excellent Here Maps and Here Drive. The latter provides free turn-by-turn navigation out of the box, and the ability to download maps means the navigation service doesn't use any mobile data, just the phone's built-in GPS chip. 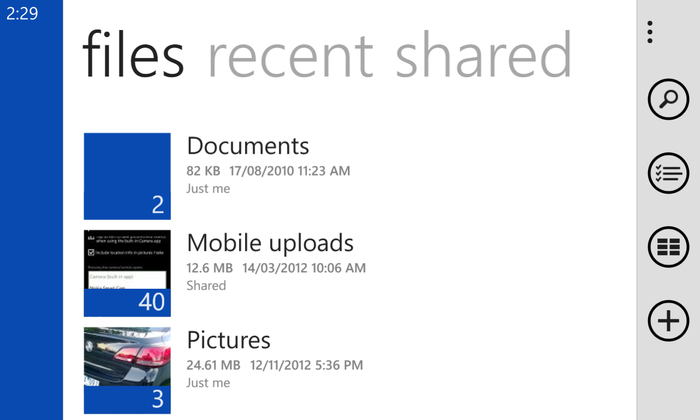 The Windows Phone OS is fast and smooth to use. 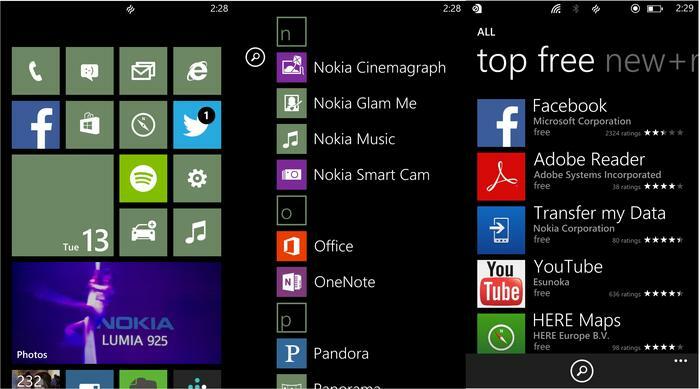 Many apps we use on a daily basis on iOS and Android aren't available on Windows Phone. Despite Nokia's excellent bundled apps, one of the biggest issues with the Nokia Lumia 925 and the Windows Phone OS itself, is the lack of popular third-party apps. A visit to the Microsoft App Store will quickly tell you all you need to know but many apps we use on a daily basis on iOS and Android simply aren't available on Windows Phone. It's not about the number of apps here, but the number of important apps that have quickly become popular on smartphones. A few examples include official Dropbox, Pocket, Instagram, Pinterest, Flipboard, Snapchat and Any.Do clients. These apps and many more may eventually come to the platform, but they're not available right now. Further, many of the non-official apps we used were awful and attempted to masquerade as an official app, while the price of apps on the Windows Phone platform often seem higher than competing platforms. All in all, the lack of quality third-party apps is an issue that we suspect will prevent most average consumers switching from iOS or Android to a Windows Phone like the Lumia 925. The Lumia 925 remains one of the best camera phones on the market. The Lumia 925 has the same 8.7-megapixel camera with optical image stabilisation as its predecessor but Nokia says it has added an additional glass lens. It remains one of the best camera phones on the market. The best results are seen in low-light conditions, where the Lumia 925 is able to capture more detail than most other camera phones we've reviewed. Minimal image noise, excellent colour reproduction and accurate detail are highlights, though the overall colour tone can often appear more neutral than most other smartphone cameras. Video recording is also excellent, and the optical image stabilisation works well. 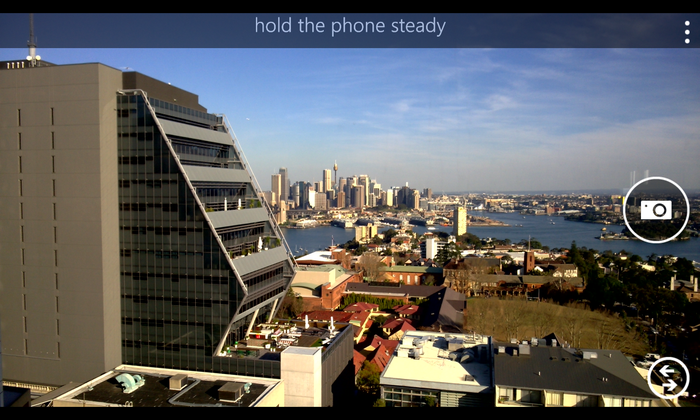 Windows Phone's default camera app itself is fast and slick but the Lumia 925 is the first Nokia phone to come preloaded with the company's Smart Camera app. It's a capture and edit tool that takes 10 images in burst mode and then allows you to select the best individual shot (Best Shot), combine multiple images and/or fade selected images (Action Shot), and select one or more items in your shot and blur everything else (Motion Focus). The app also allows you to change faces, and remove objects from photos. A photo we captured with the Lumia 925, in low light (click to enlarge). If you're a moderate user the Lumia 925 will easily push you through a full day. There's also panorama lens to capture panorama shots, a cinemagraph mode that captures movement and turns still shots into a GIF file and a Glam Me lens that enhances selfies captured with the front-facing camera. While these are all valuable additions, they annoyingly open in a seperate app to the camera despite being present in the options menu. However, you can choose to open the Smart Camera app by default when pressing the physical shutter button. The Nokia Lumia 925 offers good battery life compared to other 4G phones we've tested. On most occasions, it powered through a full day of use before requiring a recharge, lasting between 15 and 16 hours on most occasions. If you're a moderate user the Lumia 925 will easily push you through a full day, though heavy users may still need to reach for the charger before bedtime. Unfortunately, while the Lumia 925 is capable of wireless charging, it's only possible with an optional wireless charging cover which clips to the back of the phone. The Lumia 920 had this feature natively. The wireless charging cover for the Lumia 925 is available in black, red, white and yellow colours and will work with a number of accessories including a wireless charging pillow by Fatboy, a Nokia-branded wireless charging plate and a JBL speaker that will charge the phone and enable one-touch Bluetooth pairing using NFC. 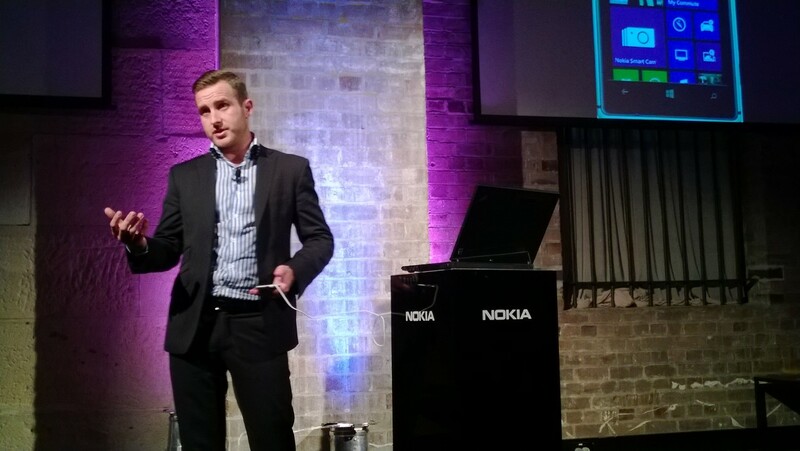 The Nokia Lumia 920 is available in Australia through Telstra, Optus and Vodafone and also sells for AU$699 outright through various retailers. New Zealand's 2degrees, Vodafone or Telecom have not announced plans to stock the Lumia 920, but the phone is available through various parallel importers in the NZ$920-$980 range.